It's been a long time since I've enjoyed this. I found a rare gem the other day in the Superstore – lamb. It’s not unusual to find lamb in Bridgewater (it’s there all the time), but the price was unusual. I purchased a double uncut rack for $6.50. They had Frenched racks there for $2.50 each. Stunning. Don’t rush out. I’m sure they’re long gone. I should have got more. I knew exactly what I was going to do with mine. I was going to debone it and make this stew. Memory’s a powerful thing, isn’t it. For me it’s especially good when it comes to food. Other stuff I can forget instantly. But a recipe I like? It’s locked in. This recipe is originally from a Time Life Books series called Food of the World, published in 1968. Each of the 27 books were sold as a 2-part set, a “travelogue” book, and a recipe book. Looking at it now the travel book is a charmer, with wonderfully dated copy and photographs. You’re instantly whisked away to a time that was far more innocent – a time when it was an adventure to tour the world, without much risk to life or limb. These books aren’t that uncommon in used book stores. They must have been popular. Just don’t try to find the recipe books. They’re kept. It’s annoying, because all of the recipes are listed in the travel book index, but only a fraction appear in it. I have never seen a single recipe book in a second-hand bookstore. I have 4 or 5 of the travel books, all hiding somewhere in my basement. Luckily I can do this one from memory. I believe this recipe is from A Quintet of Cuisines. That one offers recipes from Switzerland, the Low Countries, Poland, Bulgaria and Romania, and North Africa. As you can imagine, it’s a pretty exotic thing. They all are. The Cooking of Vienna’s Empire book has some of the best torte recipes you will ever find. If you like your dessert it’s enough to make you wet your pants. 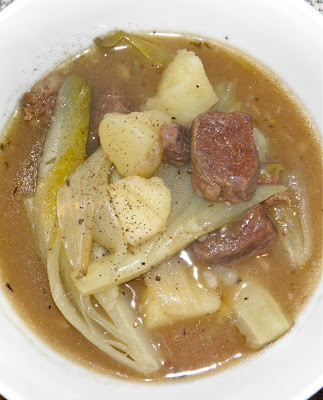 This recipe is from the Low Countries (Belgium if memory serves me right). It is an utterly amazing country dish with so few ingredients it’s not even funny. 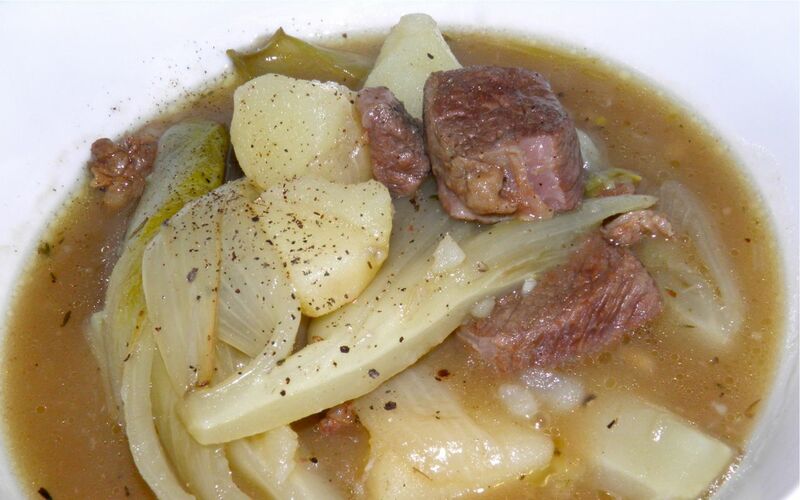 Think North American beef stew, but with tender lamb, potatoes and endive. You pretty much have it. 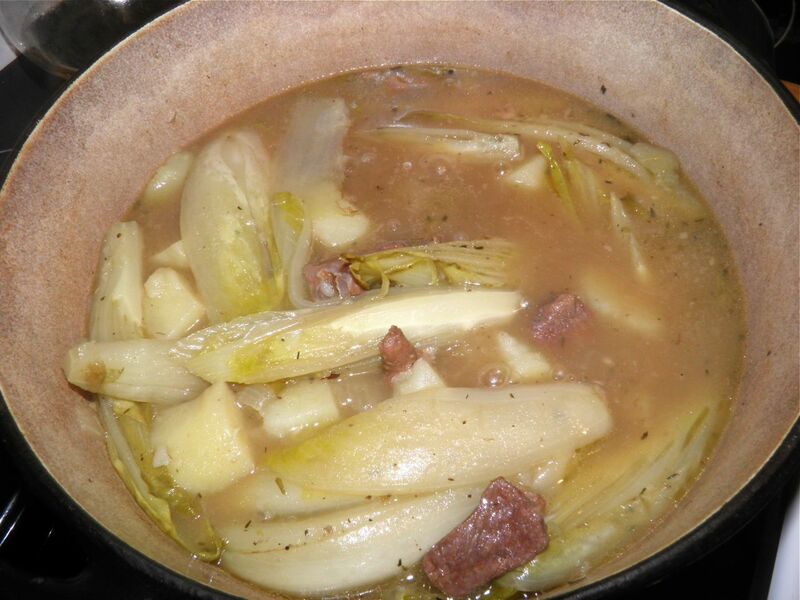 It’s wonderfully hearty with a slightly thickened broth and fantastic slightly tangy endive pieces. I’m sure my recipe has wandered from the original somewhat, but that’s OK. Isn’t that what cooking is really all about? You have to own it. Melt the butter in a Dutch oven and brown the lamb. Do not overcrowd the pot. Brown in batches if necessary. Remove the lamb to a plate or bowl. Add the onions and garlic and cook until softened. Then return the lamb and add the broth, wine, sugar, bay leaf, cloves, thyme, salt and pepper. If you believe your broth is overly salty, omit the salt until the end and then taste to determine how much you may want. Bring to a boil, and then reduce the heat to simmer. Cover the pot and let cook for 30 minutes. 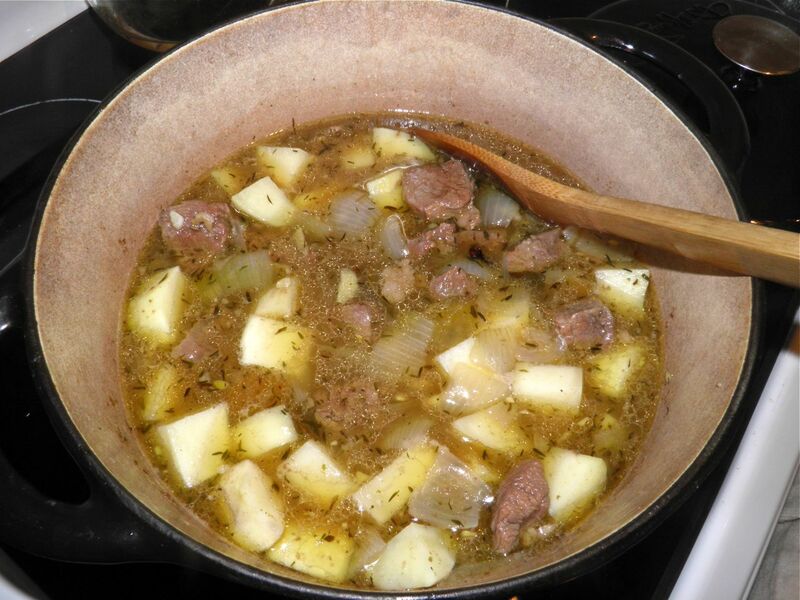 While the lamb is simmering, peel the potatoes and cube into about 1” pieces. After the half hour, add the potatoes, bring back to simmer, reduce heat, recover the pot and cook for 25 minutes more. Halve or quarter the endive along their length. If large, quarter; if small, halve. Add to the pot, bring back to simmer, reduce the heat, cover and let cook for 15 minutes more. Combine the cornstarch with the water. Add to the broth and stir until thickened. Remove the cloves and bay leaf if you can find them. Taste for salt and adjust. Serve with rolls and butter, or fresh country bread.